"Serving Ontario, Southwest Wayne and Northern Yates Counties"
An itinerant mechanic who lives out of a 1945 Flxible Clipper motor coach has made Naples his latest stopover. NAPLES - Lou Smiley hasn't always been on the move. But since he gave up a permanent home more than 20 years ago for a life on the road, he hasn't wanted anything else. 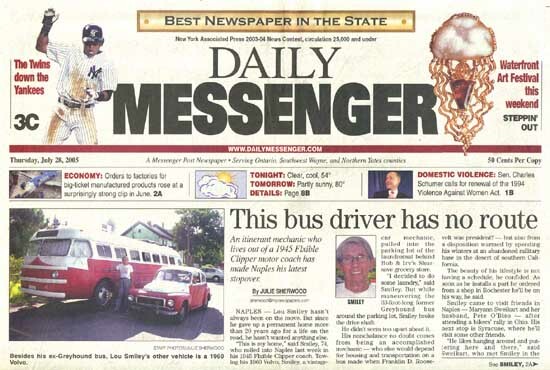 "This is my home," said Smiley, 74, who rolled into Naples last week in his 1945 Flxible Clipper coach. Towing his 1960 Volvo, Smiley, a vintage-car mechanic, pulled into the parking lot of the laundromat behind Bob & Irv's Shursave grocery store. "I decided to do some laundry, " said Smiley. 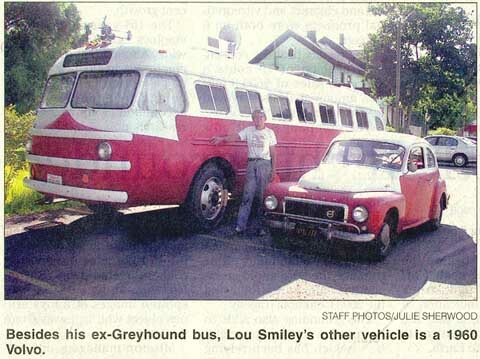 But while maneuvering the 33-foot-long former Greyhound bus around the parking lot, Smiley broke the drive shaft. . He didn't seem too upset about it. His nonchalance no doubt comes from being an accomplished mechanic - who else would depend for housing and transportation on a bus made when Franklin D. Roosevelt was president? - but also from a disposition warmed by spending his winters at an abandoned military base in the desert of southern California. "The beauty of his lifestyle is not having a schedule" he confided. As soon as he installs a part he ordered from a shop in Rochester he'll be on his way, he said. Smiley came to visit friends in Naples - Maryann Sweikart and her husband, Pete O'Biso - after attending a bikers' rally in Ohio. His next stop is Syracuse, where he'll visit some other friends. "He likes hanging around and puttering here and there," said Sweikart, who met Smiley in the mid-1990s in Mesa, Ariz. Her old Honda Civic needed work, and Smiley was there to do it. "I got friends wherever I go," said Smiley, whose wife, Pamela, is traveling separately in her own 1971 Lazy Daze van. For years, they lived in Rockland County, northwest of New York City, in a rented house. In 1982, when their landlord decided to sell, they wanted to find a cheaper lifestyle. Then an old Winnebago turned up for sale for $5,000, and they decided to give it whirl. "We've been in every state," said Smiley, who operates his mechanic's shop in the winter from a 1968 International step van. In 1997, while traveling through southern Virginia in a 1940 Yellow Coach, he spotted a rusty 1945 Flxible Clipper coach off in the trees. "It was pretty trashed out," said Smiley. He nonetheless bought it and fixed it up, and it has been home ever since. The rig and its occupant have created a lot of curiosity, said Bob & Irv's owner Rick Rennoldson. "Guys come in and say, 'Now, what year is that?'" remarked Rennoldson. Smiley, says, " he sounds like an interesting fellow."